(Phys.org)—Researchers have found that some of the current financial policies aimed at increasing the stability of financial networks may actually be driving them toward instability. The problem arises because these policies typically focus on the stability of individual banks—but due to the complex nature of networks, what's good for individual banks may not be good for the banking system as a whole. The good news is that the results may make it easier to assess the stability of the financial system, since they suggest that regulatory authorities should be focusing on the big picture (composed of market-scale information that is freely available), and not details from individual banks (which require lots of data and the continued cooperation of banks to supply it). 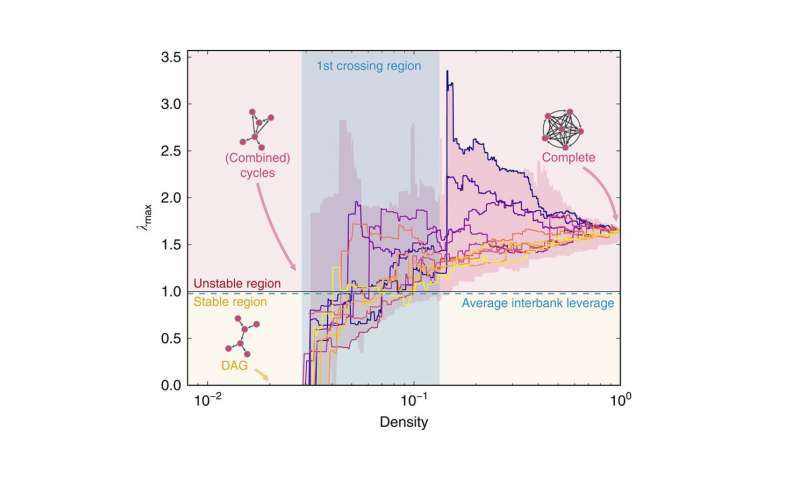 The researchers, Marco Bardoscia et al., have published a paper on their findings regarding the instability in financial networks in a recent issue of Nature Communications. "The fact that the attempt to reduce individual risk can actually increase systemic risk had been discussed before in the context of financial contagion," Bardoscia, at the University of Zurich and the London Institute for Mathematical Sciences, told Phys.org. "The paper explains why this happens, which is through the emergence of peculiar cyclical structures in the network of contracts among banks, and it makes the point that some policies can have the unintended consequence of facilitating the emergence of such structures, thereby creating the ground for future instabilities." Some of the policies that are commonly implemented to help stabilize the financial system focus on increasing the interaction between banks. For example, policies that promote market integration aim to align the prices of banks in different locations, which increases the number of banks participating in the financial system. Also, diversification policies, which spread investments over many different types of contracts, involve increased interbank interaction. Currently, regulators assess the stability of the financial system by looking at the stability of individual banks, and their data shows that market integration and diversification do help stabilize individual banks. It's often assumed, then, that these policies also help stabilize the financial system overall. However, in the new study, the researchers' analysis and simulations show that these policies may not increase the stability of the entire system. To show this, the researchers modelled the banking system as a network that becomes denser with increased bank interaction. In network language, a policy like market integration that increases the number of banks increases the number of nodes, and a policy like diversification that increases the number of contracts among banks increases the number of links. As the network grows larger, and continues to be highly connected, the problem that develops is the emergence of cycles (in credit, housing, or other sectors). To demonstrate, the researchers performed simulations starting with a stable financial network. They gradually added nodes and links, each time rearranging the network so that the individual leverages of all of the banks do not change—in other words, the individual banks remain stable. But as the network grows denser, cycles emerge, and certain combined cycles cause distress to quickly propagate through the network. Overall, the results suggest that financial stability policies must carefully consider network effects, since the emergence of instability arises from the structure of the network and not from any criteria related to individual banks. Policies that focus solely on the stability of individual banks without accounting for network effects may end up doing exactly the opposite of what they intended. Studies need to be done on similar effect due to social support systems. Reminds me of all the different versions out there of the Grand Unified Theory. Some imaginative researcher/team hypothesizes a novel postulate of Explaining Everything. Sometimes, the clever researchers develop an experiment to prove their idea. Yep, Their concept of GUT is proven true by their experiment. Hoorah! Let the funding flow! Meanwhile, in a far away laboratory researchers are developing an experiment that will prove their GUT hypothesis is correct. Whoops! Now we got two contradictory GUT proofs. And over there, another one? Then a fourth and fifth and they keep popping up like Whack-A-Moles! How many of those critters are there now, squabbling and scrounging for peer recognition and maybe, finally, acceptance? Cause it's really getting tiresome trying to keep up with it all! Risk = Mouse Eats Cat || Cat Eats Mouse || Anything else that sends the market scurrying. "Reminds me of all the different versions out there of the Grand Unified Theory." "How many of those critters are there now"
Apt. Current trading systems are impenetrable, their methods learned, not programmed.